Last week, while rifling through the lump of cold numbers that is the 2011 season, I stumbled upon a self-illuminating chest of gold coins: A reliable, fielding independent hitting formula. Today, we’re going to take it to the next level and get nerdy up in this beach. In 2010, Matt Klaassen wrote “FIP for Hitters? Defense Independent Offense.” His work in the article — though it does stay truly defensive independent and does not bring BABIP into the conversation — probably mirrors my work the most. However, his works is different both in process (he excludes BABIP and does not use wRC+) and intention (my tool focuses on regression, not really true talent levels). In the middle of last year, Jack Moore got freaky with walks, strikeouts, a special ISO, BABIP, and home runs. Moore’s work also resembles my own in many ways. The key differences are: (1) the greater complexity of formula, (2) the inclusion of POWH (an ISO on hits only), and (3) Moore’s impressive display of algebraic prowess. Ultimately, though, Moore’s work is not park nor league adjusted (a benefit ShH accrues through using wRC+), and it also is not defensive independent. 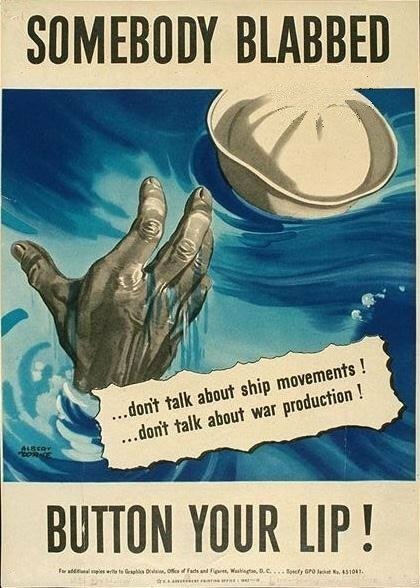 Well, PrOPS, spelled with one O, is a tool Hardball Times had been using for many an age. It’s an OPS predictor that uses a player’s batted ball data (line drives, groundballs, etc. ), walk rates, strikeout rates, homer rates, and home ballparks to spit out the OPS his hitting profile suggests he should have. Outside of being regression-based hitting-prediction tools, though, PrOPS and ShH have little in common. Where ShH is almost suspiciously simple, PrOPS is all-encompassing — and oddly less reliable (apparently a .81 R-squared, go figure). Still each of these three metrics provide interesting insight and different angles of the same pursuit: understanding hitters. Well, ShH just took it to the next level today. Last week, many commenters — and myself — began to suspect ShH was systematically undervaluing speedy hitters, who hit more doubles and fewer homers. Because ShH has no doubles component or triples component (other than the unfairly weighted BABIP, which says both events equal 1), the Jose Reyes-types appeared to be getting a short shrift from ShH. 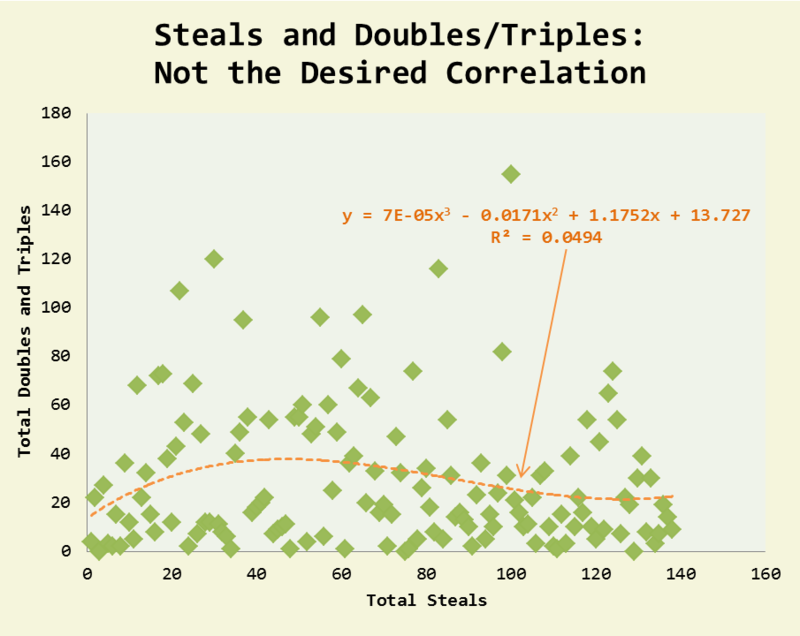 The hitters from 2009 through 2011 showed a weak — maybe even nonextant — relationship betwixt double/triples and steals. Still, when we look at the top and bottom tiers of speed, we see there’s a problem. Looking at the best 37 thieves (i.e. 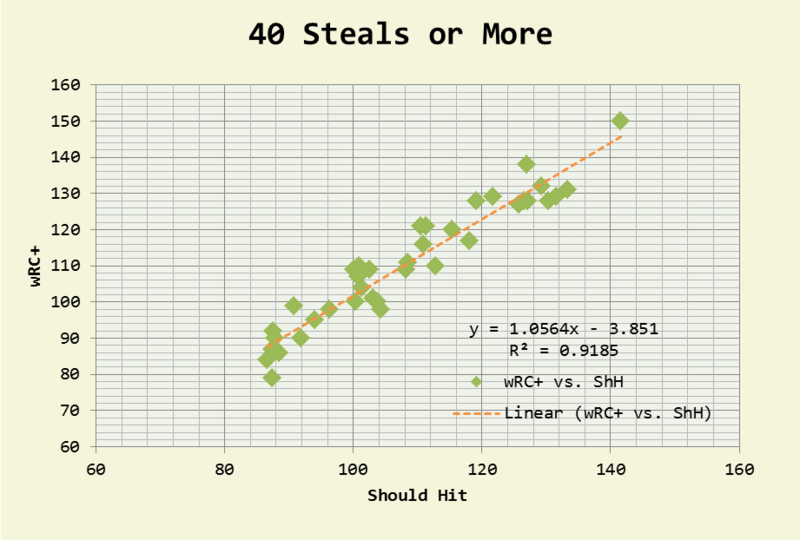 those with 40 or more steals) from 2009 through 2011, we find that ShH undervalues them by an average of 2 points. 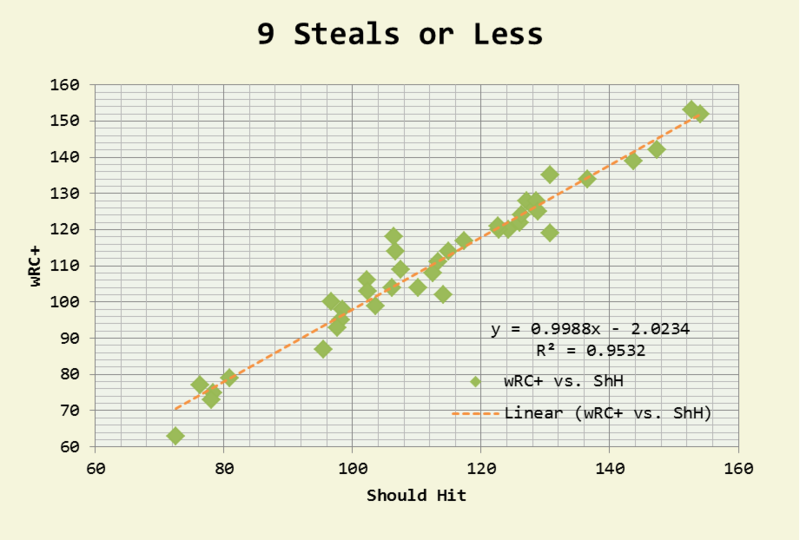 Conversely, the 38 slowest lumberers (9 steals or less) were overvalued by 2 points. So, yeah, maybe ShH undervalues speed hitters? FIP — ShH’s mother — does the same thing with groundball pitchers and other specific types (thus: we need SIERA). HOWEVER: Should Hit’s value is not in telling us a player’s present wRC+ — that’s what wRC+ does on its own. Should Hit allows us to adjust for a players BABIP — given his present peripherals. We are comparing the player internally, not externally. In other words, we would not want to use Jose Reyes’s ShH to compare him to another player, but to compare him to himself with a different BABIP (or walk rate, strikeout rate, etc.). NOTE: You’ll need to save the Doc to your own Google Docs collection or download it as an Excel spreadsheet. Unfortunately, I can’t let just anybody edit it, or t’will likely be abused. 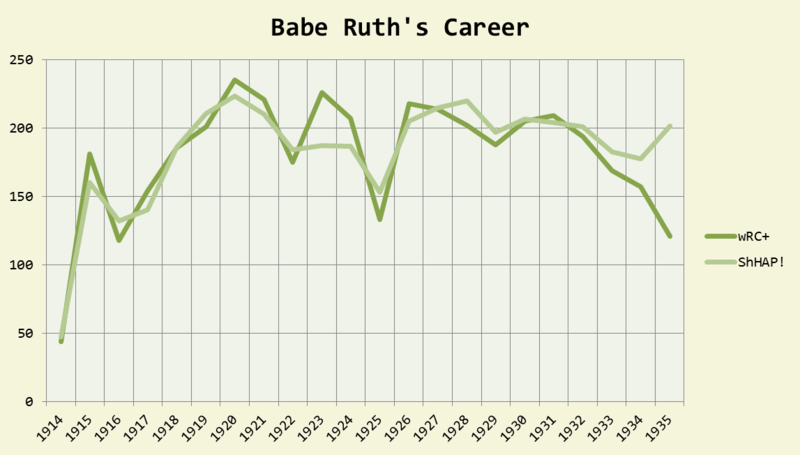 Let’s look at Babe Ruth’s 1923 season — a great season by any standards — wherein Ruth hit 226 wRC+ with a hefty .423 BABIP. Using his career BABIP, ShHAP! says he would have hit closer to his career norm — actually, worse. Here we see ShHAP! 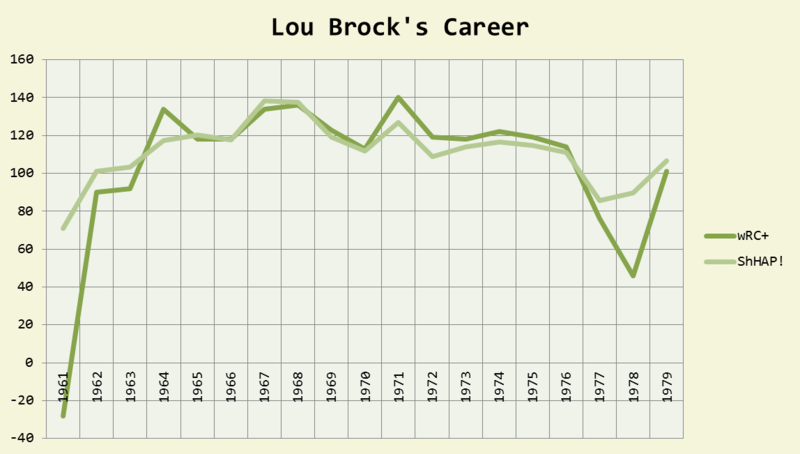 predict Brock’s late-career resurgence as a low BABIP plagued his 1977 and ’78 seasons. Overall, ShHAP! keeps very close to Brock’s wRC+ — a good sign with regards to the speedy guy problem, especially seeing as how Brock had almost as many triples as he did homers. So: Go! Play with ShHAP! and let me know what you think! Does it appear to still struggle with quick guys? We hoped you liked reading This ShH Just Got Real! by Bradley Woodrum! Can’t mess with the predictor ’cause it’s read/view only. Yeah, you’ll need to save a copy or download your own version. Let me know if it doesn’t allow you to do that.